Students Taliesin Day, Michael Verdin, and Kashi McDaniels from Venice Arts School Grand Prize winners for their film Venice Streets. 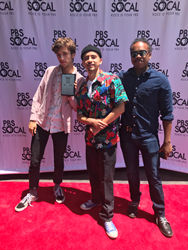 Top student producers, and their teachers and schools were celebrated at the 52nd Annual California Student Media Festival (CSMF) awards Saturday, June 2 at Harmony Gold Preview House in Los Angeles. The festival, a partnership between PBS SoCal and CUE, is the oldest student media festival in the country, and celebrates the innovative and exceptional multimedia projects produced by students from throughout California. More than 200 projects were entered into the festival. This year three new categories were added for judging: 3D Printing, Augmented/Virtual Reality, and Coding Challenge. Other categories include: Bilingual/Foreign Language, History/Social Studies, English/Language Arts, Mathematics, Fine and Performing Arts, Career and Technical Education, Science and Health, Journalism and more. The types of projects accepted in each category included: Live Action, A “Sequential Stills” movie, Animation, Interactive Stills, Website, and Interactive Multimedia Projects. Burbank High School, Burbank and New Technology High School in Napa were multiple award winning schools. The Little Raindrop, won best Animation and Clean Up! won Best Instructional Video for Burbank High School students. While New Technology High was awarded for best History/Social Studies for Signed, William Lewis Moore and best Journalism for their entry Fallout Napa Valley. Overall Elementary Curricular: Women Airforce Service Pilots Website, Olinda Elementary School, Brea Calif. Overall Elementary Craft: How to Get Organized for School, Creative Connections Arts Academy, North Highlands, Calif. Overall Secondary Curricular: Fallout Napa Valley, New Technology High School, Napa, Calif. Overall Secondary Craft:Venice Streets, Venice Arts, Los Angeles, Calif.
A cash prize was awarded to each Grand Prize winning entry’s school to help support their media and technology courses. As the nation’s oldest student media festival, the California Student Media Festival has awarded nearly $150,000 to schools throughout California.